Air Master Systems has been designing and manufacturing laboratory fume hoods since 1975. Our care and focus on quality has made us one of the top manufacturers of laboratory fume hoods in the industrial, educational, and life science laboratory markets. We’re so confident in the quality of our fume hood products we offer an exceptional five-year warranty. Our facility is in Muskegon, Michigan along the shores of Lake Michigan. All of our products are designed, manufactured, and assembled in our facility. Because we manufacture everything on site we have absolute control over the quality of our fume hoods and furniture. And that’s important to us. Each and every employee at our company has a vested interest in the quality of every product that ships out of our facility. 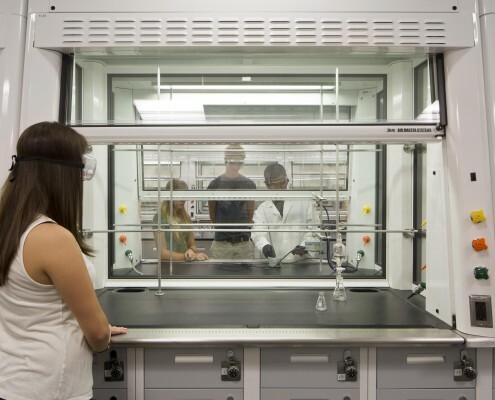 We know that students, scientists, technicians, and teachers depend on our fume hoods to protect the air quality in their classrooms and laboratories. Our first priority is your safety. We design and construct different types of fume hoods that meet the needs of many different situations. Bench mount, floor mount, and filtration hoods are manufactured to UL1805 standards. Solution Series fume hood and workstation. Photo courtesy Bowling Green University. Photo courtesy of NexLab Designs. Our skilled and talented engineers and technicians have created a broad range of standard fume hoods that meet the needs of nearly every type of laboratory situation and lab manager budget. Explore our line of Eliminator fume hoods for mounted hoods in many different configurations. The Eliminator series offers basic bench mounted hoods for CAV or VAV systems. Many liner options are available along with plumbing and electrical requirements. 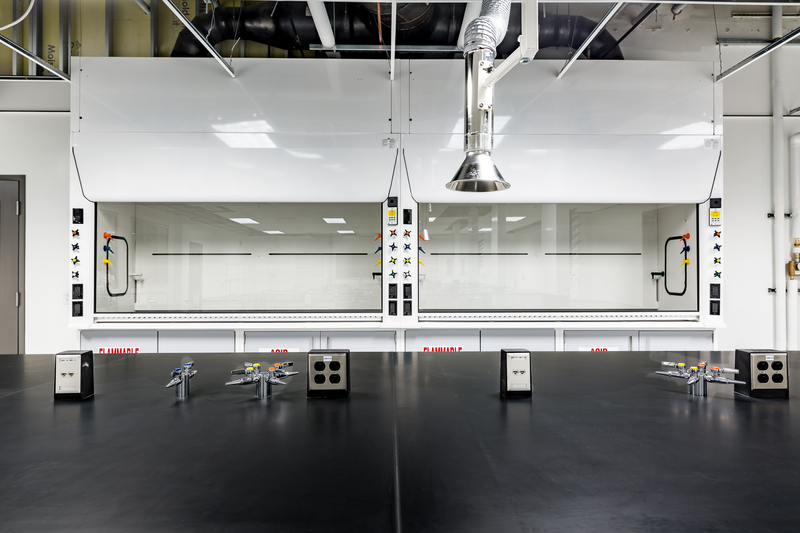 Learn more about our Green Solution Hood for an energy saving, flexible fume hood solution that offers uncompromised performance and safety. Contact the distributor in your state or us for more information to select the right fume hood for your application. In addition to our comprehensive line of available laboratory fume hoods, Air Master Systems can custom design and construct fume hoods. Whether you need enhanced features, custom sizes, or an odd configuration, all of our manufacturing is done on site, at our facility in Muskegon, Michigan. We love the challenge to work on new projects and applications.